Find your friend and punish your foe! They came in the night, surprising the young guards who stood watch. You found their bodies the next morning and one of your clan members was missing. Searching your camp, you found proof that your sworn enemy had attacked you. Enraged, you gathered the young and the strong, preparing them for battle. You go now to defeat your foe, weapons drawn and eager for blood. 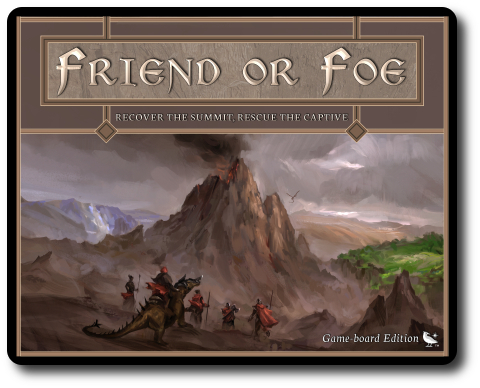 Friend or Foe, designed by Rob Gosselin and published by Birdlight Games via the Game Crafter, is comprised of 5 game mats, 48 tokens (in 4 different colors, 12 per color), 22 Green cards, 22 Blue cards, 22 Red cards, 22 Yellow cards, and 4 White cards. The cards are as thick and as durable as your standard playing card. The game mats are made of thick card stock. 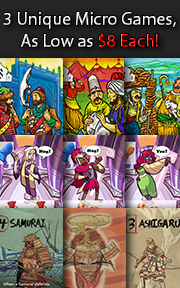 The illustrations on the cards and the game mats are impressive and clean, capturing the game’s theme and narrative. Note: There are two different versions of this game. A mobile version and a game board version. The game reviewed here is the game board version. Note: Friend or Foe can be played 4 different ways. The mode of play described here and in much of the review is referred to as “Standard”, which is meant for 2 to 4 players. For information regarding the other game modes, see the “Game Variants” section later in this review. To set up the game, first unfold and connect the 5 game mats to create 1 large game mat. The “Summit” game mat will be placed in the middle of the playing area. The 4 other game mats connect to the “Summit” game mat by way of lines referred to as “Site Connectors”. Second, have each player sit behind a game mat that connects to the “Summit” game mat. Hand to each player the 22 cards and 12 tokens that match the game mat they are sitting behind. For example, the player sitting behind the red colored game mat would receive 22 Red cards and 12 Red tokens. Place any cards and tokens not used back in the game box. Third, have each player find their 4 starting cards. Starting cards have a colored border on the card’s back. The players should all have 1 “Helper”, 1 “Focus”, 1 “Starting Hero”, and 1 “Captive” card. The “Helper” and “Focus” cards are placed face-up in their designated spots found on the game mat in front of the player. The “Starting Hero” card is placed face-up on the designated “Base” Location on the game mat. The “Captive” card is placed so “Position 1” side is face-up. 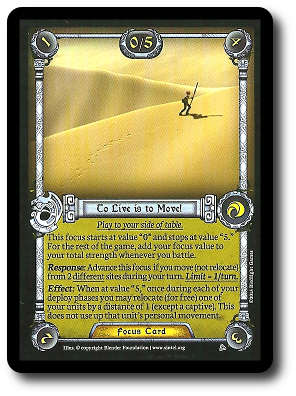 The card is then given to the player’s opponent on their immediate left. The opponent places the player’s “Captive” on their “Base” Location. All Starting cards have text that will assist new players during game set up. Fourth, each player now shuffles their remaining cards and places them face-down on their game mat’s “Draw Pile” space. Sixth, each player draws 5 cards from their Draw Pile. This is the player’s starting hand. Players should look at their cards, but keep them hidden until played. All players may take this one opportunity to discard their hand and draw 5 new cards if they think they drew poorly. All discarded cards go face-up in the player’s Discard Pile. Seventh, place the 12 tokens into a single pile behind the game mat. This is the player’s Token Supply. From their Token Supply, each player will take 7 tokens and place them in their Token Bank area, which can be anywhere the player likes as long as it’s not close to or confused with their Token Supply. Friend or Foe has 4 different colored decks of cards. Each color represents 1 unique clan. Each clan shares some cards with another, but each clan has an exclusive style all their own that makes their tactics unique. Each tactic is associated with a phase of the game. The Green deck utilizes the ability to draw resources. The Blue deck focuses on deploying into the field swiftly. The Red deck excels at combat. The Yellow deck focuses on movement. Regardless of what deck is selected, each player will have the same type of cards to work with. These cards represent specific characters, including the captured clan member. These cards also represent wild creatures that roam the land or have been domesticated. These cards represent various forms of equipment that can be attached to a Unit card. When they are equipped, Attachment cards modify specific values. These cards give the player a powerful starting ability to assist them in their hunt for their friend and the defeat of their foes. If the player is able to meet the requirements set by their Focus card, they will be rewarded with an advantage that might help them win the game. These cards give the player one or more unique actions that are only possible by use of the card. Timing is important, and if done properly, the player can position themselves for the final blow and victory. These are special cards that help the player play the game. These include the Helper cards,which summarize the player’s turn. Friend or Foe is played in turns. Each player’s turn is divided into phases. The phases must be resolved in sequential order, but a player can opt to skip a phase entirely. A player’s turn is summarized here. During this phase, the player takes 3 tokens from their Token Supply and adds them to their Token Bank. This is referred to as the player’s “Standard Generation”, meaning they’ll receive this number of tokens every turn. The player then collects 1 additional token for each Location on the game mats they currently control. A player controls a Location if they have at least 1 Unit card located on it. This is referred to as the player’s “Control Generation”. This phase must be skipped on the player’s first turn. During this phase, a player deploys their cards to Locations they currently control. A player can always deploy to their Base Location, even if they do not control it. Deploying a card is not free. 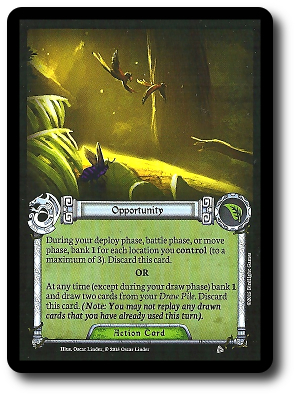 The player must be able to pay the card’s Deploy Cost. Players pay by transferring tokens from their Token Bank to a small pool of spent tokens. Spent tokens should not be placed back in the player’s Token Supply. There are two cards that can be deployed. These are Unit and Attachment cards. Attachment cards can only be deployed to a Unit card. When they are, they are placed underneath the Unit card, signifying that the Unit card in question is now in possession of the Attachment card. There is no limit to the number of Attachment cards a player can give to a single Unit card. 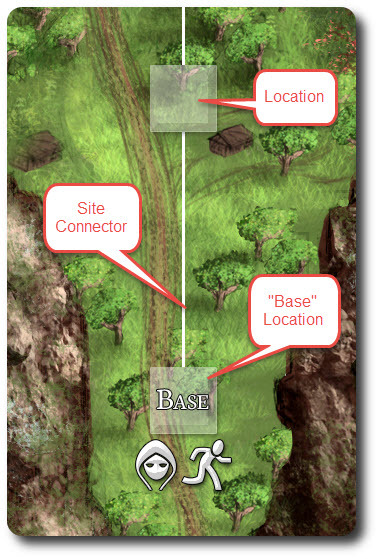 Controlling Locations and opening up site connectors is important if the player hopes to maintain a foothold on the mountains and rescue their captured friend. Battling opponents’ Unit cards is not only necessary, but unavoidable, as an opponent will be in the player’s way. Combat is resolved by completing a small number of sequential steps, but like deploying Units into the game, it will cost the player tokens to have them rush into battle. If the player is attacking from the “Summit” Location, they earn +2 Strength due to their strategic placement. The player announces from which Location they are attacking and which adjacent Location they are targeting. The site connectors between the Locations indicate the Locations are “adjacent”. In some cases, a battle can occur at the same Location. The player then takes 1 token from their Token Bank and places it into their spent token pool. Before doing so, however, the player should make sure they know how many Units are currently occupying the opponent’s Location, as all Units in an attacked Location are considered Defenders. The player now identifies which Units occupying the Location the player is attacking from will engage in battle. Not all Unit cards can be used in battle (the Unit card will say if it cannot be used). There is no limit to the number of Units the player can activate for the battle, but each Unit can only be used to initiate a battle once per player’s turn. The player might want to split up their forces to fight 2 or more battles. An opponent could foil the player’s attempts to engage in combat at this point. 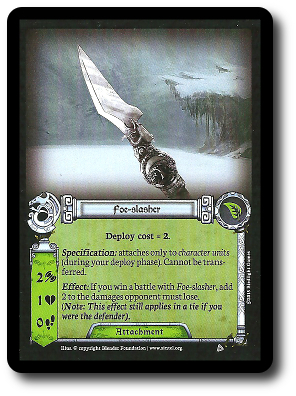 Some cards allow the players to interrupt battles by using Response abilities. All players involved in the battle resolve any Response abilities noted on their cards at this time. After all abilities have been resolved, the combat turns into a series of “trading blows”, always starting with the player who lost the last battle, which is the player with the lowest Strength value. In case of ties, the Attacker goes. The losing side continues to take a Battle action until they say “Pass”, which then allows the opponent to counter with their Battle actions. This continues until both players pass. At which point, no additional Battle actions can be taken. The damage inflicted to both sides is now calculated. The player with the least amount of Strength is the loser and the damage taken is the difference between the highest Strength value and the lowest Strength value. The loser must now discard all participating cards (only those cards used in the battle) in the loser’s Location until the total Health provided by each discarded card is equal or greater than the total damage taken. Another battle can now take place if the player likes, but only by using cards that have not initiated a battle this turn. This phase allows the player to move their Units and any Attachment cards to a new Location. The player must place 1 token from their Token Bank (referred to as “Movement Cost”) to move any Unit and its Attachments cards to a new Location within the Unit card’s Range value. The token price must be paid for every Unit that is moved. When moved using this method, the card is using its “personal movement”. Unit cards can be carried and picked up by using a Transport. If they are, they are not using their personal movement and can continue their journey after being dropped off at a new Location. Carrying Unit cards is free (does not cost any tokens), but the number and type of Unit that can be carried is often restricted. Movement along site connectors through enemy territory is never restricted, but a player cannot occupy a Location currently occupied by an opponent’s Units. There are a few exceptions to this rule. For example, the Captive card can pass through occupied Locations. This is referred to as “coexisting”, and those cards that can coexist with an opponent’s card are listed as being able to do so. 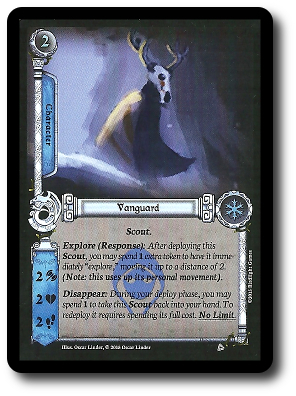 In all cases, if a Location has a card that states it’s a “non-coexistable” Unit, no other card other than the owning player’s cards can occupy the same Location. Regardless, if a Unit has enough movement to pass through a Location where they otherwise could not stop, they may do so. Thematically speaking, they crept around the Location in question without being noticed. An opponent can never, ever occupy a player’s “Base” Location. The player can now discard up to 2 cards from their hand. Then they draw back up to 5 cards. Shuffle the discard pile if the there are no more cards left to draw. Finally, the player takes all tokens in their spent token pool and moves them back to their Token Supply. The player’s turn is now over. The game continues as described above, with each player taking turns, until 1 player successfully returns their Captive card to their “Base” Location. Friend or Foe can be played a number of different ways. Each is summarized here. This method of play allows 2 players to team up against 1 player or 2 players to go against another 2 players. The game is won when both members on a team rescue their Captive card. An independent foe who lives on top of the Summit is introduced to the game, as well. A more cutthroat version of the standard method of play that gives players a chance to control an ancient dragon. 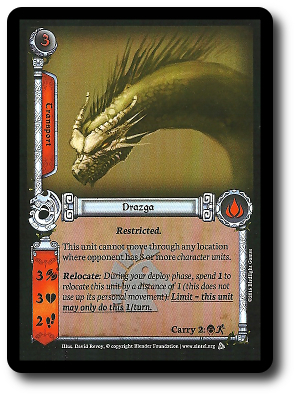 Two “Game Variant” cards are provided that introduce capture the flag game play and a bloody huge dragon that eats Units like little raisins. Using Cooperative or Ultimate Mode, the players are pitted against each other. The overall victor after several games is declared the winner. To learn more about Friend or Foe, visit the game’s website. The Child Geeks enjoyed themselves, but kept to the Standard Mode of game play. They believed the others were too involved, finding the Standard Mode to be more than enough to think about. 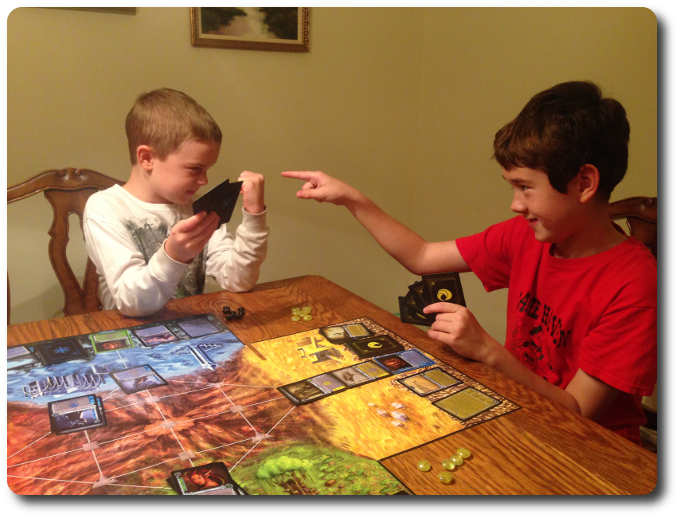 According to one Child Geek, “The game can get really complicated when you start having to keep track of all your tokens and your cards.” So complicated, in fact, that it was too much for the younger Child Geeks, but the level of aggression and depth of play was perfect for the older Child Geeks. According to one of the older kiddies, “What I like so much about this game is how much there is to do. Each turn feels really important and fun.” The final result proved to be mixed. Some Child Geeks found the game to be too much, while others found the game to be impressively entertaining. The Parent Geeks were very much the same way. The more casual and non-gamer Parent Geeks learned how to play and never really demonstrated that they had much fun. According to one Parent Geek, “I really like the game’s concept, but it just feels too busy to me. Too much is going on that I need to keep track of.” The more experienced Parent Geeks, however, really enjoyed themselves. According to one of these Parent Geeks, “I think this is a really challenging game. It has everything I like to think about. What am I deploying? Where am I using it? Can I support it? Lots of fun.” When it came right down to it, what decided if the game was approved or not for individual Parent Geeks was the perceived game’s level of required energy to play. Naturally, those who were not used to thinking so hard and on so many different levels gave the game a thumbs down while everyone else enjoyed it, shouting its praise. The Gamer Geeks very much enjoyed the game, but found the Standard Mode of game play to be rubbish. According to one Gamer Geek, “If all there was to this game was the standard game, I would turn it down. Where the real fun is at is using the other cards.” Specifically, what really appealed to the Gamer Geeks was the ability to control and battle independent Unit cards. Especially when they also had to contend with their opponents attempting to foil their plans or beat them to the objective. As one Gamer Geek put it, “Each deck plays slightly differently, making it necessary to think up unique strategies. I’m really enjoying this game.” The only aspect of the game the Gamer Geeks didn’t care for was all the card shuffling and moving about, but they quickly got used to it. They all agreed that any faults they might have found were insignificant to the fun the game provided. Friend or Foe is an interesting game. 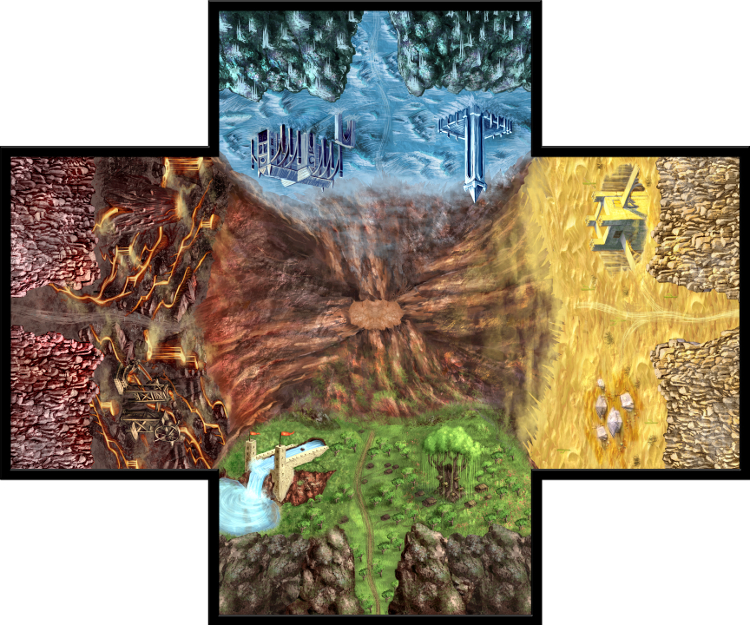 The game mats require the player to consider strategic and tactical placement, build up forces, engage foes on several fronts, and deploy reinforcements. Which is a very good thing as the rest of the game is nothing new. Cards that attack, cards that attach, and cards that support are all very common. This made it easy to teach the game, but it offered nothing new and bold to grab a player’s interest. Some of the cards are loaded with text, as well, making it difficult to convince a new player that Friend or Foe is built around straight forward game play. As mundane as some of the game is and as difficult as it sometimes appears, the game mats and the different game modes lift it out of any perceived mediocrity. Here is a game that kept surprising me. It continued to demonstrate more depth of play than I thought it capable of, required a lot of critical strategic thinking, and offered players the ability to quickly shift tactics to respond to a constantly changing game mat. The final result was a game that entertained and challenged. 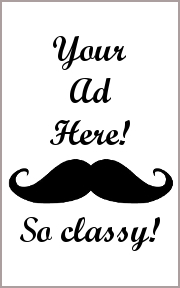 Do play Friend or Foe when the opportunity presents itself. This is not a game you should make enemies with. Tagged Card Games, Cooperative Games, Gamer Geek Approved. Bookmark the permalink.